Jumping Rope Uses Which Muscles? Many people associate jumping rope with childhood games and, as a result, tend to shun it as a legitimate workout opportunity. But jumping rope is an exercise--for adults as well as children--that burns massive amounts of calories while working most of the muscles in your body. Your arms, legs and core all sustain activity and muscle use as you jump rope, giving you a more efficient workout than running on a treadmill or walking through the park. Best of all, the lack of expense--jump ropes only cost a few dollars--makes it affordable. Most notably, jumping rope works the muscles in your calves; your calves exert most of the energy to keep pushing yourself off the ground. But other muscles in your legs, including your quadriceps and hamstrings, will also reap the benefits of a jump rope workout. Additionally, jumping rope works your glutes, helping you develop a more defined posterior. Because most people associate jumping rope with jumping and legs, they forget that the upper body can receive just as much of a workout as the lower body. As you continually jump and keep balance, you are providing a workout for the muscles of your chest, core and back. Additionally, as you are turning the rope, your forearms, biceps, triceps and shoulders receive a workout. 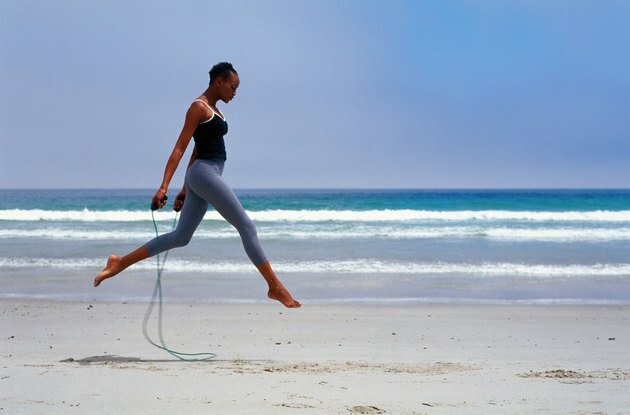 In addition to working the muscles of your upper and lower body, jumping rope also exercises your cardiovascular system. Jumping rope is a cardio-heavy activity, allowing your heart to receive just as much of a workout as if you were running or doing aerobics. And because jumping rope works so much of your body at once, it is also an efficient calorie-burner. According to “Muscle and Fitness” magazine, a 200-lb. man can burn 16 calories per minute while jumping rope.